Tis the season to be spooky! Or at least, there’s a one in twelve chance that ’tis the season to be spooky. 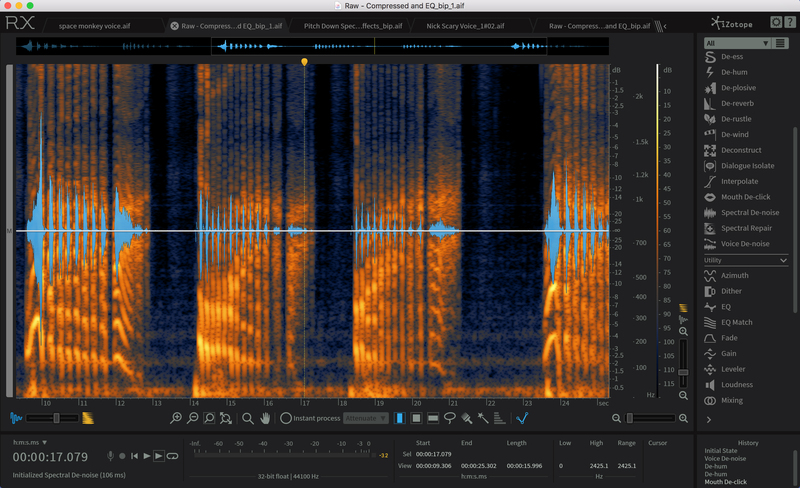 If you’re reading this in any month besides October, you have two choices: You can use these tidbits in sound-designing a spooky, scary voice for appropriate media (scary movies, web series, theatrical productions, spooky podcasts, etc. ), or you can grab yourself a stale bag o’ candy corn and pretend it’s nigh on Halloween. Either way, let’s get started. Let’s record the relatively common spooky phrase of “Bwah ha ha ha ha!” You don’t need a Neumann U 87 for this—just shape up the vocal a little; I had to record this in a conference room with a USB mic, so EQ, compression, and some light RX’ing were in order. The first tool in your arsenal is a pitch shifter, which, as you might have guessed, raises and lowers the pitch, usually in cent and semitone increments. Slide it to higher levels, and the pitch of your voice will raise (think of this like adding helium). Lower the pitch, and your voice will get lower and deeper. So, in which direction should we go? A lower pitch will engender more immediate menace, while pitching the voice up will secure a childlike, eerie vibe. Keep in mind that the more drastically you apply pitch-shifting, the more artifacts you’ll introduce into the signal—“artifacts,” here, meaning unnatural sounds that belie your processing chain. Typically, we’d want to avoid artifacts to preserve subtlety, but subtlety is not the name of the game here; in fact, we could very well use artifacts later, to induce maximum skin-crawl. So, feel free to go as crazy as I did. 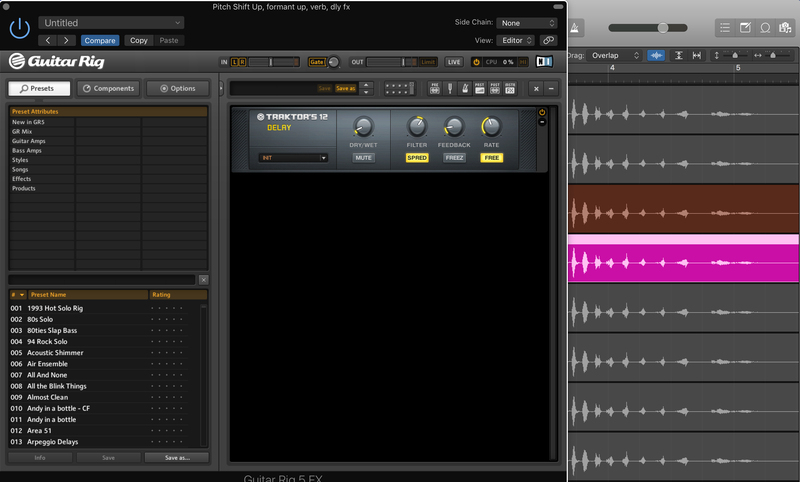 Pictured here are two tracks, as well as their respective processing. One is pitched five semitones down, while the other is pitched nine semitones up. Most DAWs have pitch-shifting plug-ins built in. Those will work just fine. Step 3: Shift the Formant! As you move the pitch, you’ll also move the formant. This might be enough, but you may also want to tweak the formant, since doing so contributes to the character of the sound. But wait—what is a formant? It’s complicated to explain, but know this: Formants are inherent in the vocal tract itself; the formant of your voice is linked to the size and shape of your mouth and throat. Formant-shifting technology allows you to approximate changes of these variances in software. 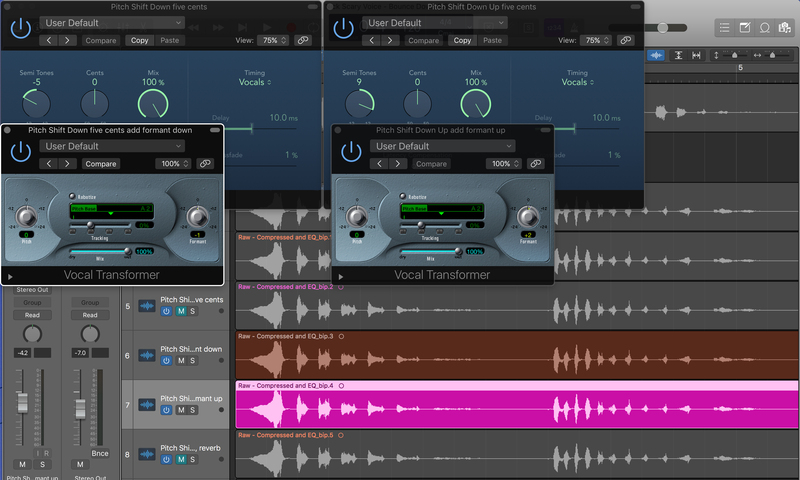 If you use Logic Pro X, the Vocal Transformer provides basic formant manipulation. 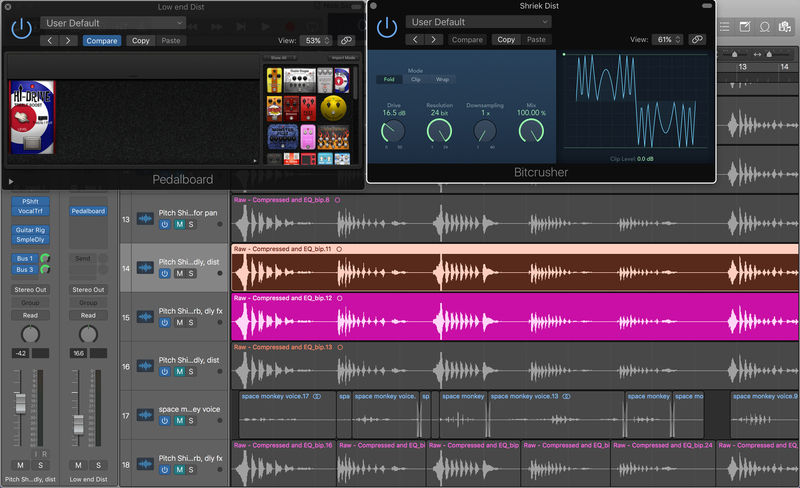 If you use Pro Tools, well, you might want to get acquainted with some of the following: iZotope Nectar, Antares Autotune, Antares Throat, and Celemony Melodyne all have formant-shifting capabilities. Free plug-ins also abound. For this application, any formant shifter would be fine. Experiment here: Higher values sound more childlike, while lower values sound older. 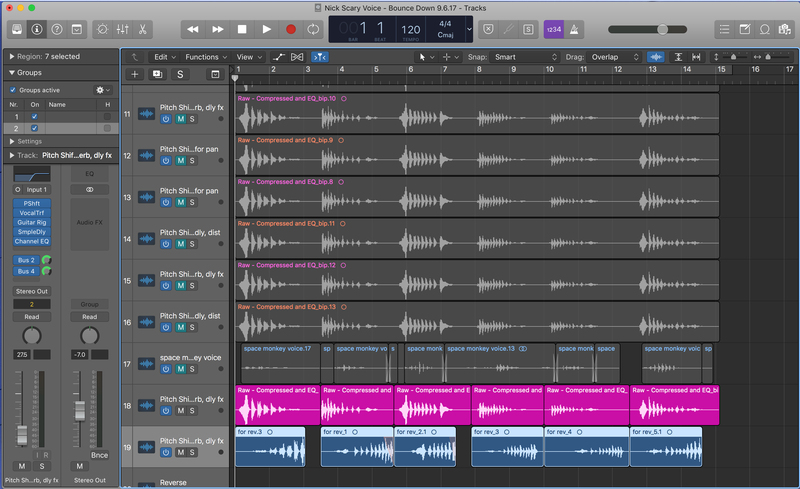 Pictured here are two tracks, with the addition of formant shifting with Logic Pro’s included Vocal Transformer. As you can hear above, shifting the formant down has had an overall darkening effect, while the high-pitched vocal, with its formant raised two degrees, now sounds artificially younger—and creepier, too! We’ve also added more artifacts into the signal; feel free to skip the formant shifting if you want to preserve more fidelity and neutrality throughout the process. Step 4: Add Some ’Verb! In many scary locales, say, a haunted house, we might want to create the feeling of echoes slapping all over the place. Confusing the sonic image is scary, because it breeds uncertainty (Where is that voice coming from?). Uncertainty breeds dread (Where is that voice coming from?!?). Dread means success! Here you can see I’ve used Guitar Rig again, this time for its Traktor Delay. This time, I’ve decided to insert the plug-in directly onto the track, because I want to commit to these echoes before going further. You’ll also notice how the sound travels throughout the space a little more, as the delay has been sent to the reverb; this is another advantage to using reverb as a send and delay as an insert. As you can see above, the deep, menacing laugh now appears in the left headphone 1,462 samples before it appears in the right (it’s much the same for the high-pitched laugh, but in reverse). Now we’ve nearly left the realm of delay and traveled into panning, because the orientation of the sound has changed. But we still hear sound in equal measure coming from the delayed channel. The result? Something more confusing than outright panning—and remember what I said about confusion causing dread? One thing to keep in mind: if the intended playback medium is mono—say, one speaker or a mono smartphone—you might want to skip using delay for panning, as the results, when summed to mono, might create unwanted, flamming consequences. Experiment, but feel free to omit this step if mono is your endgame. Step 6: Add Some Ghoulish Growl! For more weight on the deep voice, I used an overdrive pedal emulation. 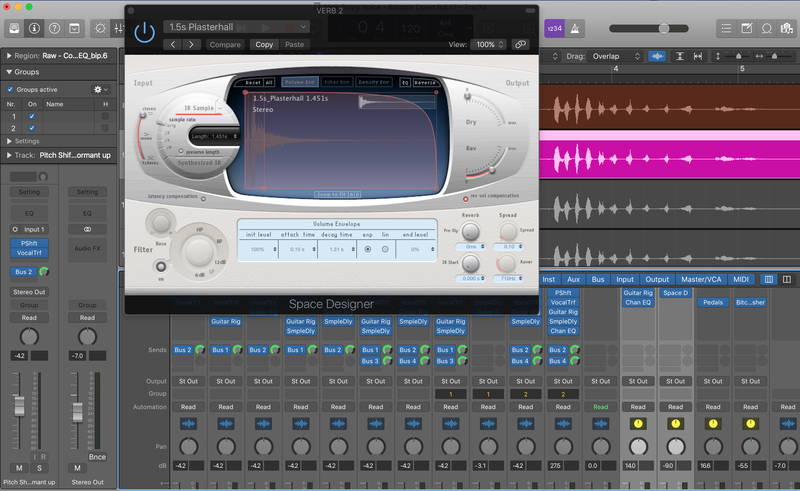 I selected Logic’s Bitcrusher for the high-pitched cackle. 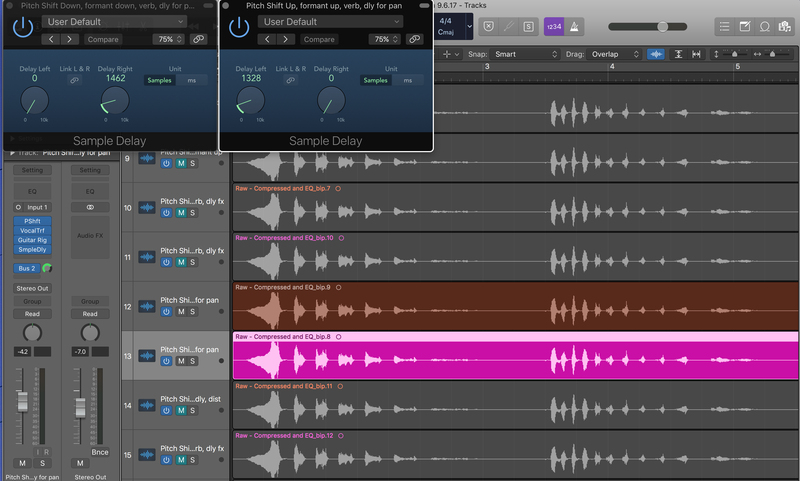 On both, I put the distortions on auxiliary returns, as I did with the reverbs, because I wanted to control the mix with a post-fader send; it worked better for blend, in this instance. You can put the plug-in on your track directly if you like. Just be careful with the blend: Just because we’re using a guitar pedal emulation doesn’t mean we’re going for an Eighties hair solo; we want to harmonically enhance certain frequencies that connote fear (in this case, the low mids for immediacy, and the highs to engender a grating quality). Alternatively, you might want to use harmonic distortion plug-ins more suited for blendable coloration, such as FabFilter Saturn or iZotope Trash 2. I have bestowed upon you the nuts and bolts of spooky voice creation. But here we enter the realm of special effects, where the world is our metaphorical mollusk. Granular manipulation, uncategorizable warping, and more are on the table. I’ve chosen two different types of processing to highlight some creative applications. Check out the lower-pitched voice. Remember how, up top, I wrote that we could use horrible artifacts “later in the process to induce maximum skin-crawl?” Here’s an example of how. 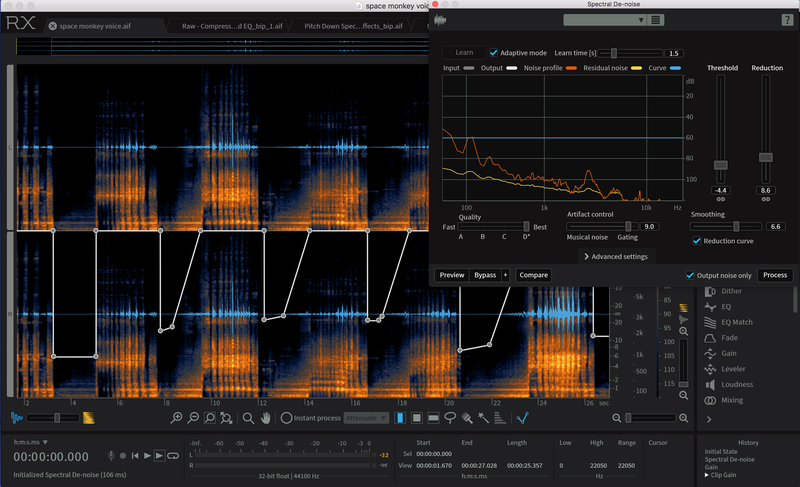 In this picture, we’ve taken our unprocessed vocal and run it through iZotope RX 6’s Spectral De-noise module. But as you can see, we’ve ticked off the little box that reads, “Output noise only.” Normally, we use this box to monitor how much signal we’re stripping away, doing this to safeguard against adding horrid, whooshing artifacts during the noise-reduction process—a sound sometimes referred to as “space monkeys.” In most circumstances, we don’t want space monkeys. But, can you think of anything creepier than space monkeys? I can’t! So, I’ve gone ahead and used the noise of this module, cut some gain here and there, and added this new track to the lower-pitched voice. The result is a background, overlaid cackle that I believe enhances the creepiness. With some basic editing and mixing, we’ve manipulated the reversed signal to add an extra dimension of eeriness. I did everything you’ve heard in a conference room, with many stock plug-ins, in a little more than an hour. While I’m pleased with the results, imagine what you could accomplish if you followed these instructions, but spent more time on each individual step? Something truly scary, I’d wager—and perfectly suited to putting in a Halloween-themed medium, like a spooky podcast, a horror short… or even a haunted-house installation! Would you like to know how to set up a haunted house for the holiday? Of course, you do! And you can—by clicking on this link. I wish that I had these resources in 1994. I was a contract computer programmer assigned to MCI, a former long distance telephone provider. MCI had a feature called "delay calling" where a message could be sent to another number in the future. This could be useful for a person traveling, calling the spouse once the plane was in the air "Honey, I'm flying home now. I'll be at the airport shortly." I was assigned fixing the problem of removing the "beeps and boops" when the call was switched to MCI Audio Response System. There was another contractor in the "bullpen", a conference room with 15 other contractors stacked side by side, that would make prank calls. Sashi would call a number in the room and when that person answered, he would hang up. After about two weeks testing various versions on the crossbar switch, the test was successful. George, an older programmer with a gruff voice was with me when I initiated a delayed message to myself. I said to George "We need to do another test." George: "Another test?" I answered "Sashi." He said "Let's do it!" I initiated the call and George used his "God of Doom" voice saying "Sahsi, we know who is doing this. Stop or we will get you!" and set the delay for 10 minutes. We went back down two flights of stairs to the bullpen to see his reaction. Eventually, Sashi's phone rang and he heard the "Voice of Doom"; his jaw dropped and his face turned pale. He accused us of doing it, but we were using a telephone. A bit a reverb would have added drama to the message, but it was a fun prank to pull.